THE day a girl faint­ed from hunger was the final straw for Emmanuel George, the prin­ci­pal of Democ­ra­cy Prep char­ter school in Harlem. She had refused to eat the “nasty food” served at his school. Her dis­taste was shared wide­ly: many went hun­gry, and those who did eat most­ly chose junk food. So in Jan­u­ary Mr George switched to a sup­pli­er of healthy lunch­es called Rev­o­lu­tion Foods. Since then the pro­por­tion of chil­dren choos­ing to accept free meals has gone from less than half to over 85%. Vis­its to the school nurse plum­met­ed, and com­plaints of stom­ach-ache and headaches have almost van­ished. Teach­ers say every­one works bet­ter in the after­noons. Every­one from Michelle Oba­ma to Jamie Oliv­er is try­ing to improve children’s diets, but doing so has proved dif­fi­cult. It is, then, par­tic­u­lar­ly inter­est­ing that a solu­tion is emerg­ing from the pri­vate sec­tor. Rev­o­lu­tion Foods, which is based in Oak­land, Cal­i­for­nia, serves 1m meals a week in near­ly 1,000 schools across Amer­i­ca. Most of its cus­tomers are pub­lic schools. 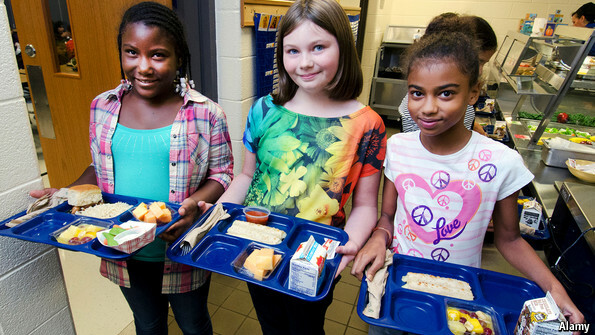 Despite a recent upgrade to the fed­er­al health stan­dards (and fund­ing) of school din­ners, most are still made rather like air­line food. Meals are put togeth­er in large pro­cess­ing cen­tres, pack­aged, some­times frozen, and then shipped across the coun­try. When they arrive, the lunch­es are reheat­ed in “retherm ovens” or warm­ers. This is cer­tain­ly cheap, but does noth­ing for taste, fresh­ness or nutri­tion. Kristin Groos Rich­mond, co-founder of Rev­o­lu­tion Foods, says despite a $16 bil­lion mar­ket for food in schools, she felt there was no good way of deliv­er­ing healthy meals. Instead she cre­at­ed a school-din­ners com­pa­ny that used healthy and local­ly pro­duced food with an empha­sis on using chil­dren to design, and test, the meals. Some­thing seems to be work­ing: the com­pa­ny recent­ly won a con­tract to serve food to 114 schools in the San Fran­cis­co Uni­fied School Dis­trict, and sub­se­quent­ly the pro­por­tion of chil­dren who chose to eat the free meals jumped by 12%. None of the fare offered by Rev­o­lu­tion con­tains junk-food sta­ples such as high-fruc­tose corn syrup or trans­fats. It is hor­mone- and antibi­ot­ic- free, and some­times organ­ic. Avoid­ing use of the deep-fat fry­er has been hard. When Ms Groos Rich­mond began work­ing with Wash­ing­ton schools she was asked to pro­vide a chick­en wing. It took over 1,000 attempts (along with tast­ings and focus groups) to cre­ate a child-approved baked chick­en wing infused with a spicy sauce. Accord­ing to the com­pa­ny, the keys to win­ning chil­dren over to health­i­er foods are good pre­sen­ta­tion and trust. As chil­dren learn that the food tastes good, they become will­ing to try nov­el­ties such as lima beans. But Rev­o­lu­tion Foods also receives dai­ly reports on what is not being eat­en. If nec­es­sary it will send some­one in to pro­mote par­tic­u­lar foods, or cre­ate signs, in order to boost demand. This hap­pened recent­ly when its cau­li­flower flo­rets were being reject­ed. On the day The Econ­o­mist vis­it­ed Democ­ra­cy Prep, pupils had a choice between mac­a­roni cheese (the real kind) and baked beans, or chick­en pas­ta sal­ad. Dessert was yogurt or whole-grain crack­ers. The menu also includ­ed sweet­corn and an orange. Lit­tle was left on the plates. A nutri­tion­ist from the com­pa­ny went from table to table explain­ing por­tion and serv­ing size with props, show­ing the chil­dren that they need to eat four to six base­balls of veg­eta­bles a day. The pupils said that ham­burg­ers and, sur­pris­ing­ly, the chick­en Cae­sar sal­ad were their favourite items on the menu. As ever, the proof of the pud­ding is in the eat­ing.